Boeing’s 737 Max line of jets won’t be flying passengers again for at least a few weeks as the company continues working on software and hardware updates deemed necessary after two air disasters, CNN reported on Monday, citing an updated timeline issued by the Federal Aviation Administration. Countries the world over grounded 737 Max jets after two catastrophic crashes, a Lion Air flight that dove into the Java Sea near Indonesia in late October 2018 and an Ethiopian Airlines crash near Ethiopian capital Addis Ababa in early March 2019, killed all 346 passengers and crew on them. Both crashes are believed to be linked to an automated flight stabilisation system called the Manoeuvring Characteristics Augmentation System (MCAS). Designed to alleviate potential stalling issues that could potentially arise from the 737 Max’s updated engine layout, MCAS automatically lowers the nose of the aircraft to compensate when it concludes it must do so. According to the Dallas Morning News, several pilots have reported getting caught in sudden descents when MCAS automatically activated. While Boeing insists that pilots can manage the malfunction by following established protocols, the Times noted that critics have questioned whether MCAS should have been introduced without more extensive training. The 737 Max operating system also relies on equipment called angle of attack sensors to “determine how much the plane’s nose is pointing up or down relative to oncoming air,” the Times separately reported, but sold a pair of safety systems that display readouts from those sensors (and could potentially indicate a malfunction feeding bad data into MCAS) as an optional upgrade. Per CNN, the FAA said in a statement on Monday (also posted to Twitter below) that it has determined that Boeing’s software fix needs “additional work” to ensure that the company has “identified and appropriately addressed all pertinent issues.” In a separate statement to CNN, Boeing acknowledged that the timeline had now changed. “Safety is our first priority, and we will take a thorough and methodical approach to the development and testing of the update to ensure we take the time to get it right,” Boeing told CNN. According to the Times, Boeing has also said it will install the angle of attack sensor safety systems as a default option in the line of jets. After the first crash, a top Boeing official told a gathering of U.S. pilots they wouldn’t encounter similar problems, contending they were better trained than their counterparts in other countries, according to a person familiar with the meeting. And the company was slow in coming up with a fix to the system identified as a major factor in the two crashes, according to people briefed on the details. 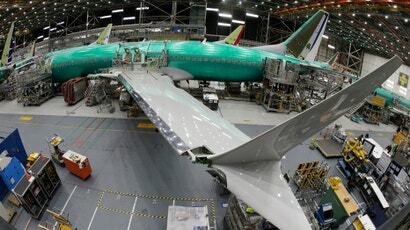 Even though Boeing said engineers had been exploring a software patch since November, disagreements between Boeing and its regulator about a host of issues relating to the 737 MAX’s operation hampered progress, according to a person briefed on the details. The patch is still not ready and may not be for weeks. A Boeing official who spoke with the Journal instead characterised the delays in rolling out a fix, which was developed in partnership with regulators and suppliers, as made out of an abundance of caution. The delay leaves two dozen Max 8 aeroplanes operating for American Airlines, 34 Max 8 jets operating for Southwest, and 14 of the larger Max 9 jets flying with United Airlines out of commission, according to CNN.